[This is the second post in a series of session summaries (i.e., a play report) for the first campaign I have run in the Curabel setting. Each summary was written by one of the players, but I am adding my own ‘DM Annotations’ on these write-ups before uploading them here. These annotations will mostly call attention to bits of the summaries that will be significant later in the campaign (with links to relevant summaries to follow as they are posted) or else explain my rational for my game-mastering choices. This summary was written by James, who played the dwarven thief named Sthorm. James lives in Australia and was a great player while we had him. He left the campaign somewhere around session ten due to scheduling issues. We continued from where we left off with Thorfus wounded and unconscious and Galron in possession of a restrained simian automaton. Sthorm noticed another of the monkey automatons perched on the catwalk near the ladder leading upwards but this one made no move to attack, content to merely observe us. The creepy monkey construct’s staring and the bit mentioned in the next paragraph about a “sound from below” did a nice job of ratcheting up the tension. The party already knew that the automata could hurt them, so hinting at an imminent attack but holding off on pulling the trigger was fun. It also cemented in the players’ minds that these enemies were not mindless obstacles, but crafty foes working on their own agenda. I have actually returned to this tactic a few times in the sessions since whenever the party seems to be getting a little too confident and it always seems to unsettle them. Thorfus was attended to and back on his feet when we heard a sound from below. Galron went to the open hatch leading downwards to look but saw nothing aside from crates. He then threw a heavy chunk of scrap down the opening and the resulting noise caused the other sound to halt but otherwise had no known effect. We decided to head down. In this new room there were numerous crates with markings indicating that they came from the Silver Throne, the largest Dwarven trade company. Some of these crates were open and we saw they were filled with automaton parts. Galron placed the monkey automaton on a crate facing a wall before we advanced cautiously through one of the doors. The incidental detail about the Silver Throne Company represented the party’s first real contact with the work of a major NPC faction that the party is still tangling with after 75 sessions of play. It would be 30+ sessions before the party identified them as a possible threat, though. This led us to a hall with yet more doors on either side. Galron pushed at the closest one with his pole and felt a force pressing against it. He tentatively pressed it open just enough to look in and found that a cabinet had been pushed up against the door but there was nothing else of note in the room. This barricaded room is where poor Osric, Talessin’s missing student, tried to hide before meeting his grisly end (see below for details). This was the not the case with the next room as upon opening it we immediately spotted yet another monkey automaton though this one was cruder and more simple in make than the others. It spotted us also and began to throw itself at Galron who swiftly slammed the door shut and beckoned to Thorfus, the key holder, to lock it. He did so and the simian was now safely locked away however it continued to make a tremendous racket from within its cell. Further exploration of the lower level revealed nothing so the group decided to head upwards. The lone monkey automaton was still in the same spot guarding the ladder and watching us intently. Galron decided to restrain the monkey as he had done with the previous one but it was not to be. Sthorm and Axel stood well back on the catwalk with their missile weapons ready, assuming this would be an easy task which would likely not require their efforts. Galron and Thorfus moved up to capture it with Ir’alle behind. The following episode encapsulates what I find most endearing about low-level play with early edition D&D. Everything goes wrong in such delightful ways – the collapsing catwalk, the friendly-fire, the absolute chaos — before the last-minute lucky strike to avoid a TPK. Please enjoy. What followed was an embarrassing and lengthy attempt to grab perhaps the most dexterous monkey construct ever created. It easily avoided all attempts to grab it and at one point even managed to overpower Galron causing the Paladin to bang his head on the ladder’s edge and leaving him stunned. Worse still the monkey had access to a number of flasks filled with acid and the clever little automaton repeatedly threw these flasks at the catwalk supports. His first attempt missed but otherwise he threw with precision and eventually that section of catwalk collapsed sending Galron, Thorfus and Ir’alle careening to the lower level. Sadly, the fall knocked out Ir’alle. Galron being stunned during an attempt to grab the monkey represents a successful use of the house rules for grappling (which involve rolling d6s for each hit dice/level). These rules specify that if the defender wins, the attacker is stunned for a number of rounds equal to the margin of victory. Axel and Sthorm, suddenly realizing that this was by no means a simple battle and being the only ones still on the catwalk with the monkey, decided to fire their weapons. Sthorm struck it well with his sling, but this only attracted its attention and the monkey leapt upon his head and raked at the Dwarf’s face. This hurt him badly. Sthorm dropped his sling and grabbed for his long sword, but, with the blood in his eyes, was unable to strike the monkey. Satisfied with the hurt that it had inflicted upon Sthorm, the Automaton then focused on Axel and struck him down easily. Meanwhile Galron and Thorfus were on their feet and headed straight back up the catwalk. Galron fearlessly waded back into the fight, but Thorfus didn’t want to engage the creature in melee again. He drew out his bow, but was unable to find a good shot on the small creature with his allies in the way. Hurt as he was, Sthorm decided to disengage from the fight and left Galron standing against it alone. This gave Thorfus a better shot and Galron called out for him to take it. Thorfus fired, but the arrow struck Galron in the back and he went down. The situation was dire with three men down and the remaining two heavily wounded. The monkey launched itself at Sthorm who swung at it with his longsword. Miraculously the blow struck, parting the automaton’s head from its body. Thorfus and Sthorm immediately went to check on their comrades and performed some basic first aid to stop their bleeding. Relieved but exhausted, the two discussed what to do next and they decided a tactical retreat was the smartest option. Thorfus first gathered up the monkey’s head and body and then they carried their fallen friends with the help of Uthrak, who had been surprisingly useless so far, to the tower’s entrance where they momentarily set the bodies down. Thorfus went to unlock the door and, whilst he was doing so, Sthorm snatched up the lockbox that Galron had prevented him from taking earlier and stowed it in his backpack. The door was now open and the men once again gathered up their allies and headed back to the Lucky Gam tavern. I took it as a very good sign that these players were smart enough (and humble enough!) to know that retreat is sometimes the best option. That’s not always the case, especially now that many players’ expectations for RPGs are shaped by video games. Also, as mentioned in my last session summary post, Uthruk’s player left the group after the first session due to scheduling conflicts and didn’t return for almost an entire year. The aside about his uselessness references this fact. He did, however, end up acting as nurse to the injured characters and, when we retired him from the party after this session, I decided he would pursue his new passion for tending the sick and injured. When he rejoined the group this led to him having some minor healing abilities. Talessin and two of his students were in the Gam’s common room. They saw the group arrive immediately and their looks of disappointment were obvious. Thorfus told Talessin to wait whilst he saw to getting the wounded accommodations and then generously paid for two private rooms. Axel, Galron and Ir’alle were sent to bed with Uthrak watching over them whilst Thorfus and Sthorm went to talk to Talessin. When appropriate, the disappointment of NPCs can be a powerful tool for motivation – much more so than ridicule. Talessin and his students don’t belittle the party or call their skill into question, but still let the group know that they have failed to meet the expectations people have for heroes. Those other possibilities allow the players to respond aggressively to the NPCs questioning their abilities; that’s not as much an option when there’s no direct insult. Thorfus explained the situation and showed Talessin the automaton they had destroyed. Talessin was interested in the intelligence the monkey had displayed but was disappointed that it and the Dwarven automaton had been destroyed. Sthorm suggested that they could still complete the job if Talessin would give them time to wait and rest, but this idea was received coldly. Thorfus then suggested that healing could be purchased so that we could get to work sooner, but that our funds were limited. Talessin offered an advance payment of 150 gold pieces for the one automaton we had left undamaged and Thorfus gratefully took this and asked for directions to the nearest Ark temple. It was very close so Thorfus set off with the money whilst Sthorm stayed behind in his room and smashed open the plundered lockbox. He was delighted to see that it contained 300 gold pieces which he stashed in his pack before kicking the broken container under his bed. Much like the free healing the party earned last session for their merciful treatment of the street thugs, this bit of negotiation (and Sthorm’s thievery) rewarded the players for using smart tactics while avoiding the unrealistic notion of everyone waiting around an entire week to heal while the automata were left to their own devices. Thorfus went to the temple and got a priest to come back with him, though the price was left unclear until the priest had seen how much healing would be required. He examined the wounded and noticed that one of them was a Paladin of his faith. He declared that the cost would be 75 gold each and that the price had been discounted for having a champion of the faith amongst our number. Talessin’s payment was nowhere near enough for all five men, so Thorfus took all the gold he could find on the unconscious members and pooled it with his own gold and Talessin’s. However, we still we came up short. Sthorm finally volunteered 100 gold pieces out of the 300 he had recently accrued and we had the money. Ir’alle was brought to consciousness, but the other two after healing were still out of it. Ir’alle shared some kind words with the priest and Thorfus thanked him and sent him on his way. Typically, I assume the cost for having spells cast is 100GP * Spell Level + component costs under ideal circumstances (with further premiums depending on the spell). Knocking an extra 25GP off because the party’s paladin shared the cleric’s faith seemed reasonable and not too much of a giveaway. It’s also my experience that being a paladin often means forgoing the monetary rewards available to other adventurers, so this kind of “payment in service” arrangement helps offset that a bit. We rested the night and, in the morning, Ir’alle prayed for healing powers which he then used on the wounded. He brought them to consciousness, though they were still exhausted. Galron was feeling melancholic after our humiliating defeat and tried to drink the pain away, but even after 4 drinks he felt no different and went back to bed. Thorfus spoke with both Talessin and one of his students, asking for any knowledge or advice that could aid us, but learned little of use. We slept another night and woke feeling refreshed and healthy enough to go back to the tower. I believe the paladin’s attempt to get drunk was handled with a constitution ability score check that increased in difficulty with each drink (3d6 vs. con, 4d6 vs. con, etc.). His inability to become inebriated was one of those funny things that happens when you leave this kind of stuff to chance – the humor of this, much like the comical attempts to grapple the monkeys, helped the player group bond a bit more — especially since Galron’s player was a good sport about it. The group went back to the tower and made our way to the double doors leading into the catwalk room. Thorfus and Sthorm listened at the door and heard some distant banging that sounded very much like the banging they had heard previously when the monkey automaton was at the table constructing its fellows. Thorfus opened the doors and we headed through into the catwalk room but fortunately nothing appeared to be different and aside from the destroyed Dwarven automaton there was no others we could see. Galron sensed an evil presence above and immediately made for the ladder leading upwards with the group following behind. I had decided when the party left the tower that what they found upon their return would depend on the amount of time that had passed. Since it was only the morning of the second day after their last foray, no new enemies were in the lower levels of the tower. If they had needed another few days to recover, that would not have been true. Galron made his way up the ladder and saw at the top that there a trapdoor with no discernible lock. Holding onto the ladder with one hand he grabbed his trident in the other and used it to lightly press up on the trapdoor. The door began to lift but then Galron felt a sudden force push down upon it so heavily that it knocked the trident from his hand and sent it crashing down to the floor. Galron took out his long sword and pushed back at the trapdoor but this time with as much force as he could muster so that the trapdoor swung up and open. Galron climbed up the rest of the way and found himself in what looked to be Talessin’s personal quarters, with shelves stacked with many thick books, a bed, and a desk. More importantly, in front of Galron was a sort of pedestal upon which was a clear dome topped with a circlet and what appeared to be a brain suspended in liquid within. Behind Galron was another Dwarven automaton and a human boy, but Galron ignored them and charged straight at the pedestal. 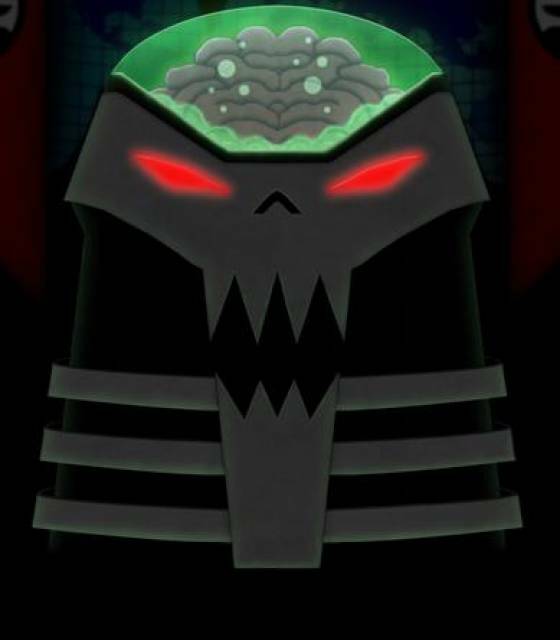 My model for these “overseer” enemies were the Daleks from Doctor Who and the Brain from DC Comics (especially as illustrated in the original Teen Titans cartoon). I really wanted something creepy and alien to foreshadow some of the other science-fantasy elements that would eventual arise in the campaign. Thorfus came up behind Galron and to his horror got a proper look at the boy. The top half of his head had been removed and the brain scooped out. The boy’s cranium was filled with wires and bits of metal and his stare was empty and soulless. The boy punched at Galron and hit him lightly, but he seemed to have no awareness of what of he was doing. Axel came up the ladder and went for the Pedestal with Galron whilst Ir’alle and Sthorm ascended and moved east towards the bed where it seemed safest. This cyborg-like reimagining of the zombie allowed me to introduce a bit of body horror into the game and foreshadow the way the Ancient Dwarven empire treated the other races who were their servants and slaves. It also let me know that this kind of violation of the individual would be a powerful motivator for my player group — something I would see again when they became aware of a slave-trading ring. Galron arrived at the pedestal and grabbed for the circlet, remembering Talessin telling them that without it the overseer would be unable to control the automatons, but somehow he missed it completely. The Dwarven automaton behind him did not miss, however, and Galron was knocked unconscious to the ground. Axel then attempted to grab the circlet and managed to put his hands around it. As he lifted it, though, a surge of energy struck him and knocked him out cold. The circlet settled back into place on the dome. his allies go down and having no fear of magic, Thorfus approached the pedestal and grabbed the circlet. He ripped it off, and, since the pedestal had not been able to recharge, there was no energy outburst. With the circlet removed, both the Dwarven automaton and the boy collapsed lifelessly to the ground. Ir’alle used his divine powers to restore Galron and Axel to consciousness. Galron got up and for the first time saw the boy and what had been done to him. This filled him with outrage. He felt certain that the brain in the overseer’s orb belonged to the boy and that the automatons could not have performed an operation as delicate as brain removal. He therefore presumed that Talessin must be responsible. A nice example of paranoia and righteous indignation, another set of useful emotions for motivating players to act. Galron went to the lone door in the room and beckoned Thorfus to open it with the key. Thorfus did so and Galron threw the door open revealing that it led out onto the balcony. Thorfus looked down into the street and saw Ethan, one of Talessin’s students, watching over the tower as he had been ordered to do. Thorfus called out and beckoned for Ethan to come up. Ethan seemed hesitant, but eventually made his way up. Ethan arrived and was shocked to see what had happened to his fellow student. Galron and Thorfus questioned Ethan about Talessin’s involvement, but Ethan knew nothing. He could only say that no one had been allowed into Talessin’s room and that the students had no idea about what had been happening up here. Galron angrily left the room to confront Talessin with everyone except Sthorm following. Sthorm took the opportunity to search the nearby desk and found a locked drawer. He opened thiss with his lock picking skills. Inside the drawer was a book with a silver clasp, a wand, and a pouch full of coins all of which he placed into his backpack. He also searched the bookshelves, but found nothing except some very thick tomes of no interest in him. The coins stolen by Sthorm were specified in the session as platinum coins; this was significant because the players’ guide clearly stated that platinum currency was not used on the islands’ governments but rather by the human empire. This had already come up during character creation and while the players shopped for equipment, but they failed to catch the significance of this detail. Talessin may not have been a murderer (yet), but he had some unsavory ties that would become significant later. When that happened, it was nice to point back at this moment and show the players one of the clues they missed. Meanwhile, Galron marched into the Lucky Gam and straight up to Talessin’s room, banging on it with his fist. Talessin opened the door and Galron could see behind him on a table was the destroyed monkey. Galron questioned Talessin about the boy and the brain, but Talessin denied having removed the boy’s brain. However, he did admit that the brain in the overseer was put there by him, but he preferred to not reveal where that brain came from. Galron was uncertain, but calmed down somewhat. 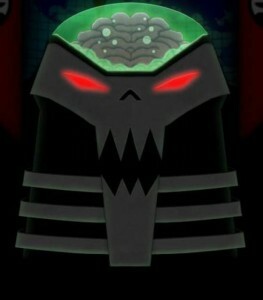 It’s interesting that no one thought to follow-up on where the brain inside the overseer originated. It was never revealed in-game, but Talessin had acquired the brain from one of the City Watch morgues where he sometimes volunteered his magical services to help investigate crimes (and spy for the empire). This connection to the City Watch, though, would become significant. Talessin was pleased that the situation had been resolved and seemed unconcerned about his student’s horrific end. Galron asked why he should not just go to the authorities and tell them everything, to which Talessin replied that, not only did they have an arrangement, but if the guards were to take the student’s body then he would be unable to investigate the true cause behind all that had happened. Galron still felt uneasy, but suggested he would feel better about keeping quiet if they could find the boy’s brain. The group agreed to go back and look. Back at the tower the group scoured for the brain, with the exception of Sthorm who said that he felt it was a waste of time. In reality, though, he was just avoiding Talessin. The group’s search took them down to the lower level where they had locked in the monkey (which was now silent). They opened the door and found the monkey on the floor, totally inert without the overseer to control it. A search of this room revealed a second brain, which eased Galron’s suspicions. Finally, with everyone satisfied, it was time to collect payment. Talessin went to collect the money from his desk, but found the drawer unlocked and the contents missing. He questioned the group about this, but none of them knew anything about it. He seemed troubled by it, but believed them and asked them to wait outside whilst he got the money from his hiding place. Talessin returned and doled out the payment, a total of 400 gold pieces including the bonus 100 for the overseer and 300 for two preserved automatons (but not for the third, for which he had already given money to Thorfus). Talessin also noted that it would be a bad idea to disappoint Desric and so he would give them some — but not all — of his schematics. This would allow them to complete the job for the dwarf, which would serve as a bonus payment for a job well done and also protect their reputation. Talessin totally didn’t believe the party, but was shaken up by their accusations earlier and threat to inform the authorities about his experiments (which might, in turn, reveal his connections to imperial forces). He was trying to placate them with generosity – the same motivation for handing over some schematics. With the money and the papers, the group then went back to Desric and gave him the schematics. He was clearly suspicious at how few there were and questioned the party about it. Galron admitted that Talessin had given the schematics to them as a bonus reward, to which Desric asked if they had found any others whilst in the tower. The group honestly replied that they had not because they were more preoccupied with the automatons than searching for notes. Desric seemed displeased with this, as he had sent them specifically to search for the notes, but ultimately he paid the agreed price of 50 gold each which came out to 300 gold. The interaction with Desric illustrates the drawback of having a paladin with you when trying to play both sides of a deal. Still, they did complete the task for which he hired them. That concluded the introductory adventure, setting things up for the party to take on a more involved job for Desric beginning in session three. For two sessions of play, I felt it did a pretty good job of establishing player expectations, detailing the world and how it works, showcasing the rules (both standard and house), and allowing the party to coalesce into a more cohesive unit. Overall, I was pretty happy with the outcome and felt the foundation that had been laid for further adventuring was solid. At this point the session ended. Since Thorfus was not in the room when the platinum was “obtained” by Sthorm, I did not worry about it as a player, since I couldn’t act on that knowledge. Granted, I did not catch the significance until you pointed it out much later. However, I think it was much more realistic the way it played out. Knowing what we later learned about Talessin, we might have changed how things played out, had we made a few more connections. Initially, Thorfus did not trust Descric and viewed Talessin as the one they should trust. Later information would show that to be totally backwards of how we should have seen them.